Accept credit / debit card on delivery payment with or without an extra fee. 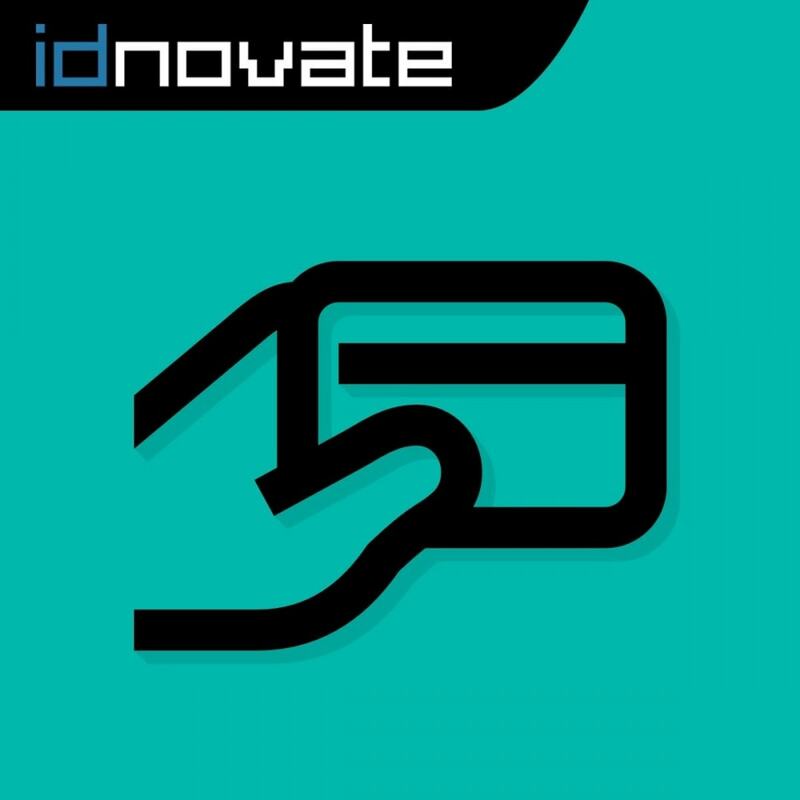 The favourite payment method for your customers! Now can pay to the courier using a debit / credit card! This module will increase your sales! You can offset the extra cost of this shipping method by charging a fee to the customer. The card on delivery payment method allows your customers to pay for the order at the time of receiving their order, they pay on shipment using a debit / credit card. This payment method is the perfect solution for customers who do not trust other payment methods, such as an online card payment or PayPal, and prefer to pay upon receiving their order. With this method, you can offset the additional cost normally associated with "cash on delivery" by charging a fee to customers that choose this payment method. 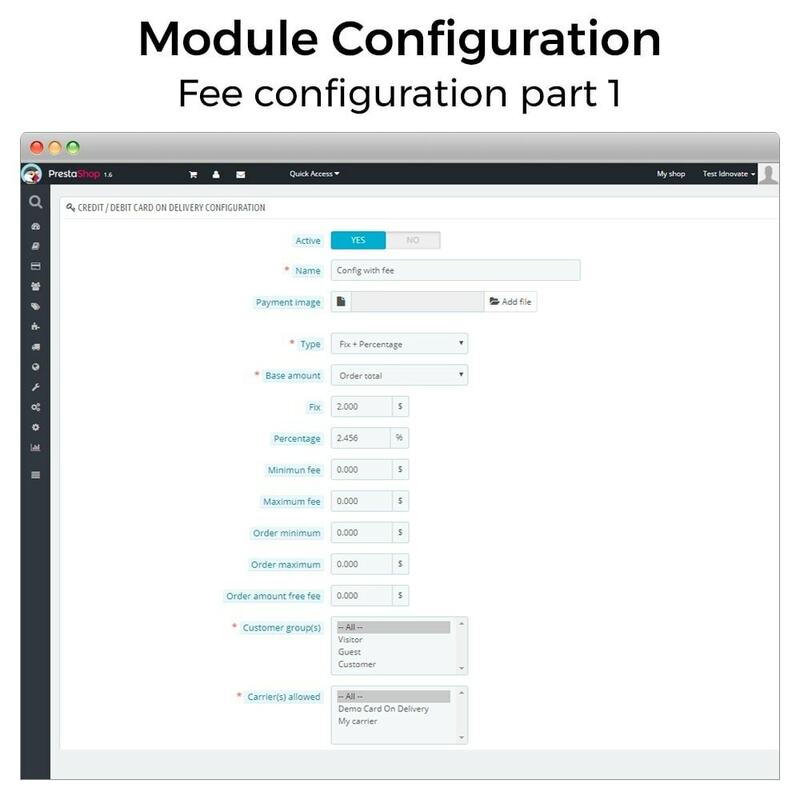 This module allows you to add the "card on delivery" payment method with the option of applying an extra fee. Compatible with back office orders! Also, you can configure as a pay upon delivery with card without applying a fee! Customers will benefit from the payment options most used and preferred by them. Configure multiple commissions. You can configure more than one rule for calculating the fee depending on the customer group, the carrier, country, area, product category, manufacturer and supplier. The rule that meets all the conditions, or if more than one, will be applied which has higher priority. Application of a fixed fee. Charge your customers the same fee regardless of the amount of the order. Apply a fee based on the percentage of the total order. Charge a fee depending on the amount of the order. Apply a fee based on quantity fixed over a percentage. Charge a flat rate plus a fee depending on the amount of the order. Option to not apply a fee. You can configure this payment method to use it without a cost. Option to round order total. You can configure to round order total and increase fee with difference. Useful to prevent cents in countries that are not allowed in hand-to-hand payments. 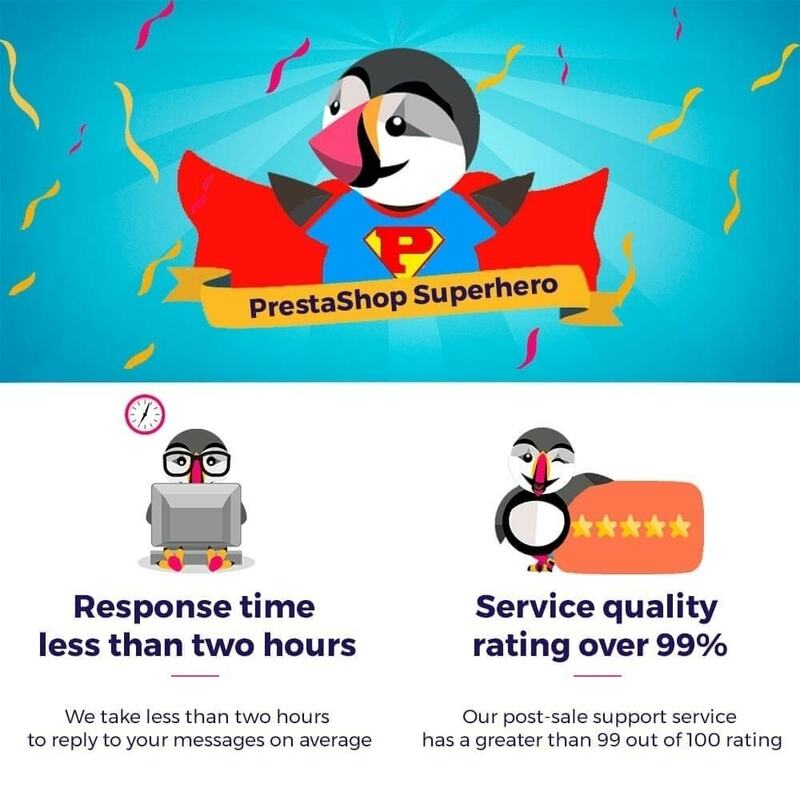 Possibility to hide on customer first order. 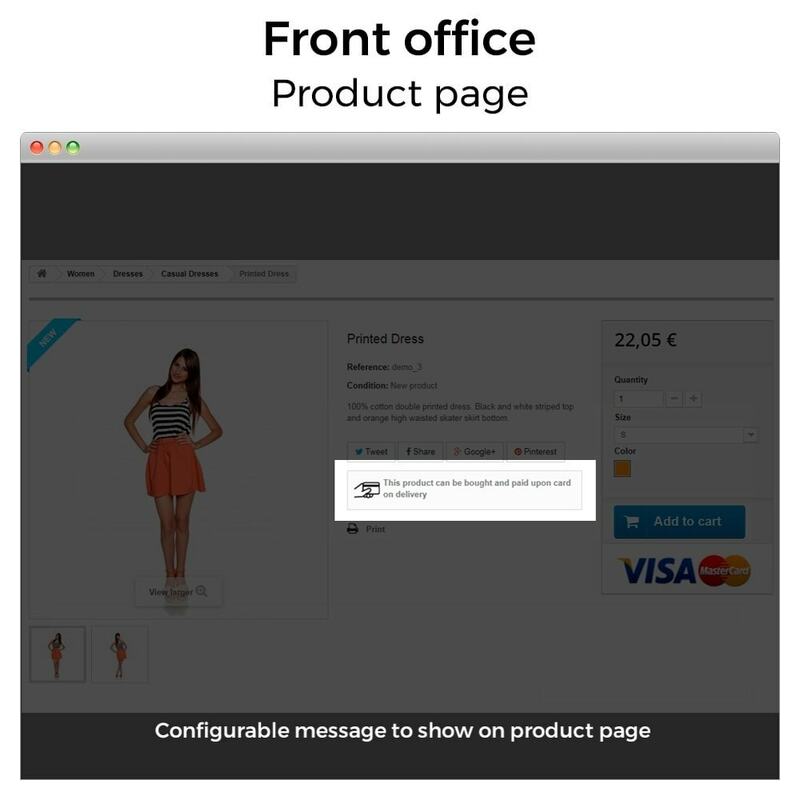 You can configure the possibility to hide this payment method on customer first order. Option to disable this payment method on out of stock products. If the cart has a product out of stock, you can hide this payment option. Allows you to set a minimum and maximum order size to show this payment method. Orders with more or less than the configured amount will not be able to make payments with this method. Allows you to establish a purchase amount where the fee will not apply. 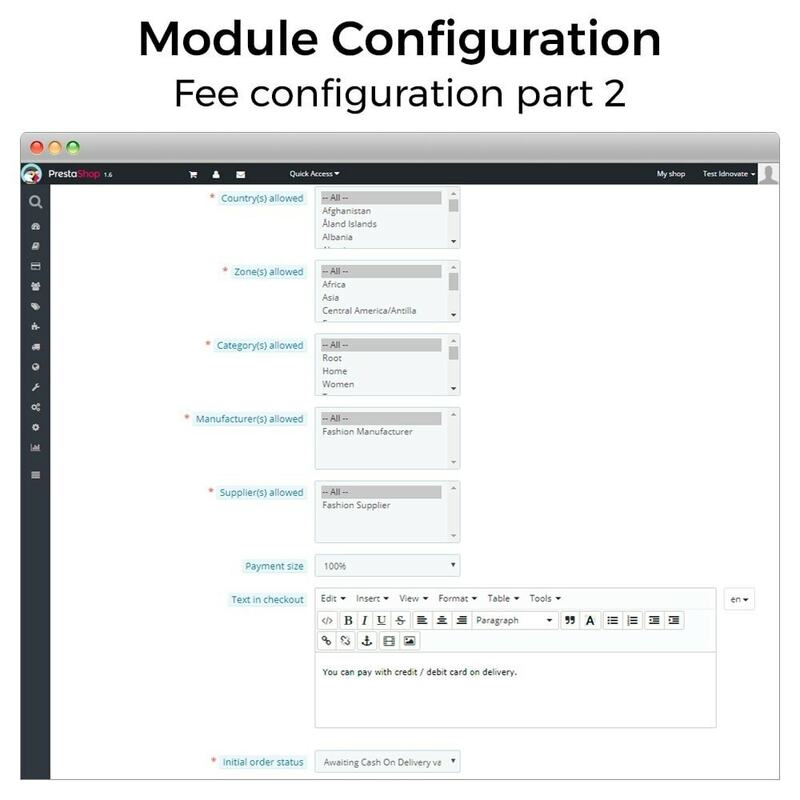 If the order exceeds the configured amount no fee will be charged. Allows you to select which carriers/shipping methods will be shown with this form of payment. 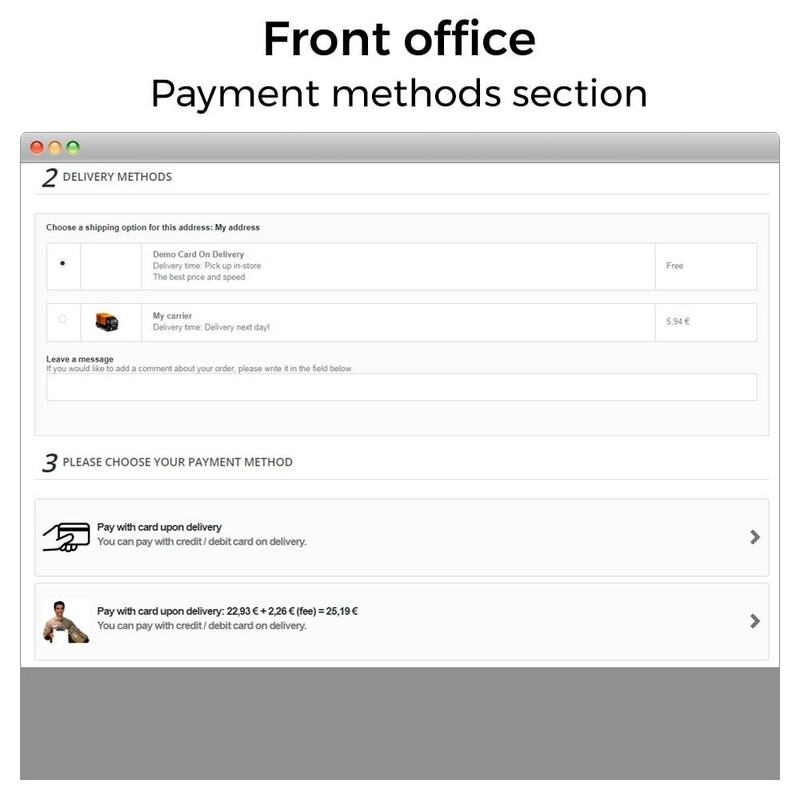 Configure which shipping methods will appear with the payment method. Choose to which group(s) of customers, country(ies), region(s) category(ies), manufacturer(s) or supplier(s) where this payment method is enabled. Compatible with Back Office orders! Now, you can create new back office orders applying defined fees. The fee is displayed separately in the cart and the invoice. Avoid the order confirmation page. Improve your store conversion by eliminating a step in checkout. The order will be validated automatically when the client has selected this payment method. The fee is calculated based on the customer's currency. Configure the status in which the order will be generated when you select this payment method. Compatible with Advanced EU Compliance module. 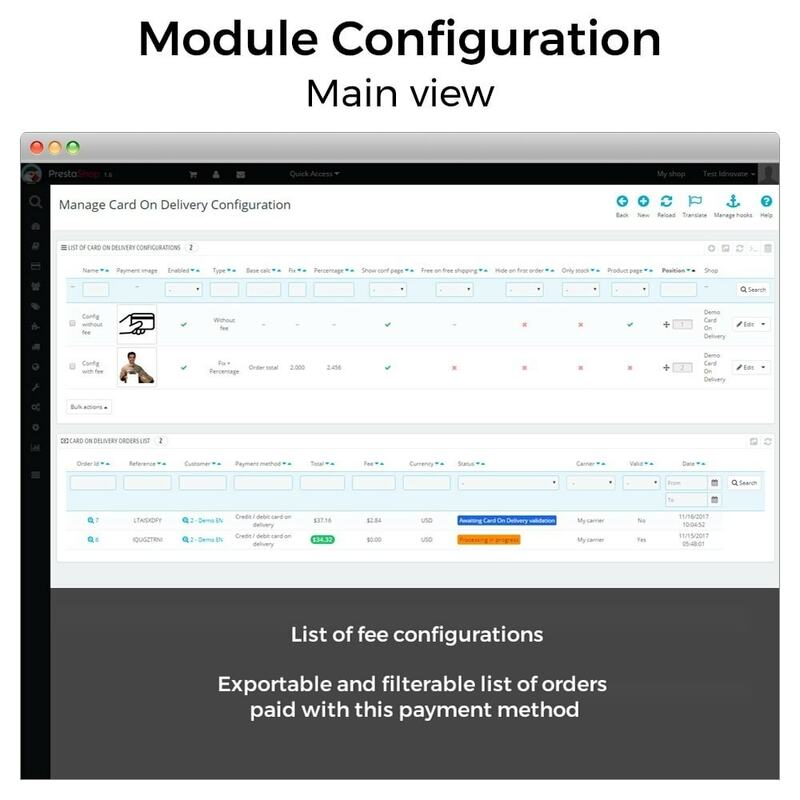 This module is 100% compatible with other modules (including one page checkout and Advanced EU Compliance). 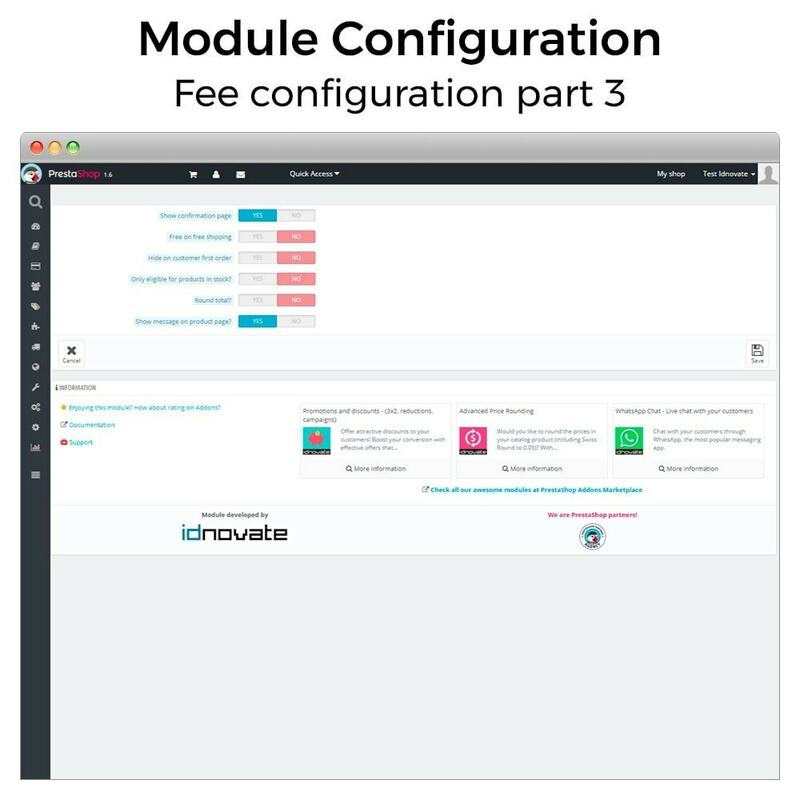 In any case, if any inconsistency arises when installing our module, our compromise is to solve it for free if it's in our hands. The card on delivery payment method is a customer favorite, since they don't have to make a payment until they receive their shipment, which gives them security and confidence. This payment method allows your customers to have another way to pay for their orders online, which is used by most online stores.